See also Initializing Nasal early, Aircraft Center and FGCanvas. Scheme agreed by James & Thorsten at FSWeekend 2012 to fix reset / re-init weirdness. Re-init of all subsystems doesn't work, because many subsystems don't support it. (There's an ticket 419 open bug about this in the tracker). Instead we have 'reset', which does some special operations, but is different logic from normal startup. This leads to bugs when the reset behaviour differs to a fresh start. 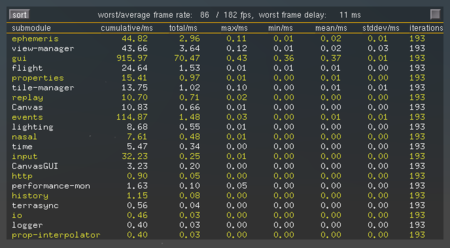 JSBSim has issues with resets since it doesn't read simulation state each frame - this is why you can't resume flying from a recording / replay for JSBSim aircraft. Note this is a different issue from problems with in-air starts, which also needs some tweaking to work with JSBSim. Yes, reset and save/restore are a bit broken in FlightGear right now. I'll try to fix them when I have a chance, but it will require a bit of refactoring (removing Curt's initial-state stuff, for example). For details, see Fixing Presets. The original reset was a simple kludge that worked fine for a simple program; now that FlightGear is a lot more sophisticated, we need to refactor a bit rather than just holding things together with scotch tape and bubble gum. The problem is that right now we have two different approaches - a lot of stuff is handled cleanly in individual modules' update() methods, but a lot of stuff is still handled by hundreds of lines of BASIC-like, hard-to-read spaghetti code in main.cxx and fg_init.cxx (forget OO, it's not even functional programming). That was the right idea to get started - I'm not a fan of wasting time on an initial OO design that you won't end up using -- but now we need to finish cleaning it up. We need to make this a high priority. ↑ Jim Wilson (Wed, 05 Jun 2002 16:38:32 -0700). Crash on "Reset" function..
↑ David Megginson (Mon, 24 Nov 2003 07:22:13 -0800). Re: Helicopters: wow!. ↑ David Megginson (Thu, 06 Jun 2002 05:03:39 -0700). Crash on "Reset" function..
reset looks to most subsystems like ‘off and on again’, i.e nothing should survive in terms of instances - everything is destroyed and re-created. This includes Nasal so add-ons should just work. Any property data needs to survive should be marked on the SGPropertyNode with a flag (I think it’s ‘archived’ but I will check), it will be saved across the reset, and hence visible to the subsystem when it comes back up again. No special Nasal or signals should be needed, since the idea is that reset looks exactly like a full shutdown and then a clean start. Adding additional signals will break that concept, and potentially bring us back to a dangerous world where some systems behave differently on reset to first-time-init, which is a very bad thing in my opinion. — Thorsten (Sep 25th, 2015). Re: Please test the 3.6 RC. We have already cleaned up a lot of subsystem / initialization things over the past year - and more things are planned. Eventually, I hope we can just recreate an FDM at any time ("out of thin air"... ;-) ) with arbitrary initial settings. — ThorstenB (2012-11-11). Re: [Flightgear-devel] flight recorder / replay system. In-sim reset causes a whole host of subtle issues in addition (not sure how much of these reposition triggers...) so I'd recommend not to expect this to work and not to use it without a good cause at the moment. — Thorsten (Sat Mar 14). Re: Time Setting and Airport change within FG session. places that only need to re-position will use the new ‘reposition' command, which is a simplified version of the current reset (and will become even simpler over time, but for now the goal is maximum compatibility). This means the 'select airport' and 'position in air' dialogs, principally. James is not expecting any build failures since the code is already in Git, but I would ask that any bug-reports are only made /after/ wiping your autosave XML file. 2013-11-12 23:36 James Turner       Reset: changes for SGSubsystem ownership. 2013-11-12 22:26 James Turner       Reset: explicit close-window function. 2013-11-05 05:31 James Turner       Reset: route-manager guard against no plan. 2013-11-10 12:32 James Turner       Reset: panel-node cleans up listener. 2013-10-06 17:36 James Turner       Reset: Nasal can be shutdown. See Howto:Reset/re-init Troubleshooting for the main article about this subject. this is _not_ a circular-reference leak, but not actually unreachable memory at all: the old objects are still referenced from somewhere, just not anywhere that actually knows it should free them. The amount of memory lost depends on location but not significantly on aircraft: about 150MB over ocean, plus as much as the scenery was using over land, suggesting that the lost object is roughly "all the scenery". — Rebecca N. Palmer (2015-03-26). Re: [Flightgear-devel] Large memory "leak" on Reset. memory usage (at least immediately) after Go To Airport appears to be the _maximum_ of normal usage at the 'before' and 'after' locations, not simply the usage at the 'after' location (expected) or their sum (simple leak). Get rid of reset / reinit entirely, and simply re-run the normal init sequence after tearing down almost everything. (What remains, is to be decided by testing - probably scenery, maybe nothing else at all). The requires reliable deleting + cleanup of subsystems - i.e fixing and fixing all the places using statics incorrectly. Some work towards this has already been done. The current property tree mirror needs to be replaced with some similar, but simpler logic, to preserve the user-archive properties, and re-overlay them after the property tree is rebuilt. This is simpler than the current 'clone the entire property tree' logic which also causes bugs. Indeed, one approach would be to actually update the autosave.xml as we do at shutdown, and re-read it. Hence no difference between a reset and quit + restart. Subsystems that remain alive must hence be checked that they unbind / re-bind correct, since we will get a new, clean property tree root. This will be easy for some cases, tricky for others. Probably only subsystems related to rendering and display should even be considered for this. No more 'X breaks on reset' bugs - less code to maintain and fewer special cases in the code. Since the property tree will be rebuilt, we can safely read a different -set.xml file without the universe imploding. Since it's a new property tree, we have to destroy and restart the Nasal context anyway. This should greatly simplify aircraft Nasal script development. Separate startup GUI frontends like fgrun may become obsolete or at least optional eventually, because FlightGear itself would become increasingly runtime-configurable (we have about 10-15 GUI launchers for FG currently). this should help improve end user usability - because FlightGear would become more self-contained, without inevitably requiring external tools to provide basic GUI configurability. given the number of separate FlightGear launchers, there are also lots of developers involved in developing and maintaining these external software packages, some of them also active FlightGear core developers/contributors - so this step could further help channel important development resources, to focus on the main project, i.e. fgfs. This is a complex change, which cannot easily be done incrementally. It will inevitably cause some breakage and issues while everything is tested. The init / shutdown code, including FGGlobals, needs to be adjusted to do the actual deletion and run init again. Most of the other init steps (configuration options) are already re-factored in this direction anyway. Any subsystems which should be retained, such as tile-manager or renderer, need to be checked very carefully. This likely requires some new SGSubsystemGroup hooks to extract the subsystems from their owning groups so they escape shutdown and deletion. Any systems with other threads need to be inerted during the reset. In particular any osgDB paged loaders, or TerraSync threads, need to be paused or audited for safety. TerraSync should be relatively simple (since it's a regular subsystem), osgDB interactions, especially with properties, will be harder. All animations and effects will need to be destroyed for sure, since they have property tree references. we have several corner-cases of FGGlobals fields that are separately managed by logic in fg_init.cxx: we should probably even consider turning the SGPropertyNode root in globals.cxx into a wrapped SGSubsystem - because the reset/re-init logic explicitly contains stuff to deal with the property tree: Whenever a "member" needs to be explicitly handled to support reset/re-init, we should consider wrapping them in a separate SGSubsystem class so that we can encapsulate the reset/re-init logic there, instead of doing that separately in fg_init.cxx, where all the important subsystem-specific logic is kept separate from the actual subsystem (not maintenance-friendly). Given the add-subsystem/remove-subsystem fgcommands/APIs, we can no longer afford having initNasalFOO() code in FGNasalSys::init() that depends on other subsystems being present. Subsystem-specific APIs must never be unconditionally added, they need to be added/released (managed) by the underlying subsystem itself, or things will break inevitably. when re-ordering SGSubsystem initialization in fgCreateSubsystems I noticed that /some/ of its systems are pretty sensitive to ordering issues, which is non-obvious because things will typically "work", until the next reset, which is when race conditions may show up (or not). We should strive to formalize such dependencies and then encapsulate them using SGSubsystemGroups - which will also be useful to better establish threading-dependencies. For the time being, it helps to shut down all background threads manually when resetting. Once we use a PropertyObject<int> for idle_state in main.cxx, we can easily use Nasal to implement the whole splash screen loop in fgIdleFunction() using a single listener. there are a few subsystems that are intended to remain PERSISTENT per session, e.g. terragear, time, lighting, events - those should probably be put into a dedicated SGSubsystemGroup that isn't subject to reset/re-init at all, e.g. outside the actual subsystem_mgr, or maybe using a new GroupType ? fgCreateSubsystems() in fg_init.cxx and subsystemFactory.cxx are now overlapping in functionality, and we've seen some inconsistencies here that may further complicate matters FlightGear commit a52c0882. It would make sense to get rid of fgCreateSubsystems() and move this into scripting space by using the add-subsystem fgcommand APIs (have this kinda working in the Initializing Nasal early branch, using a boot script). memory cleanup must be improved, see ticket 1559. ↑ James Turner (Oct 7th, 2017). Re: [Flightgear-devel] Addons - reinit (fgcamera) . This page was last modified on 7 October 2017, at 14:24.